Reno, NV (March 7, 2014) – Estipona Group won a Gold ADDY at the American Advertising Federation of Reno’s annual ADDY Awards on Friday night at the Peppermill Resort Casino. The award was for a Pandora radio commercial campaign created for Charter College to promote its medical assisting, HVAC and information technology programs. 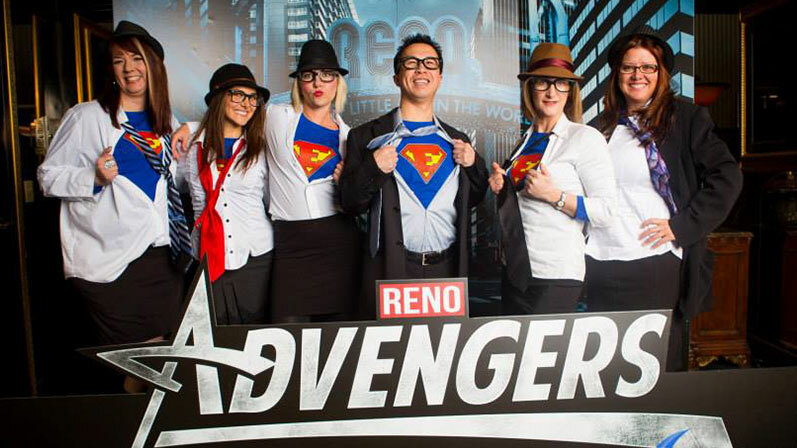 This year’s ADDY event had a superhero theme, so the Estipona team donned Clark Kent, pre-telephone-booth-transformation duds. “Clark is an apt symbol for our group: a little nerdy and ‘super’ driven to perform amazing feats,” said agency owner Edward Estipona.. The ADDY Awards are the advertising industry’s largest and most representative competition, recognizing and rewarding creative excellence in the art of advertising. Every year, 60,000 entries are submitted in local competitions. Conducted by the American Advertising Federation, the local ADDY Awards is the first of a three-tiered national competition. After vying for best in their markets, local winners compete at District levels. Winners from that level are forwarded to the National finals — the American Advertising Awards. The Estipona Group is a Reno-based communication agency specializing in advertising, public relations, social media and all facets of audience engagement. The firm’s 20-year history includes five years as a forward-thinking and client-friendly virtual agency, with all employees working from home offices and collective workspace. You can follow the Estipona Group’s antics on Facebook. Click to hear the award-winning radio.